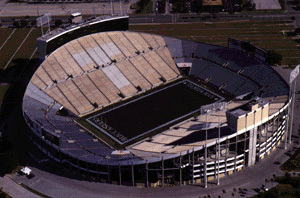 Built in 1967, Houlihan's Stadium, formerly known as Tampa Stadium, was designed to be home for the University of Tampa Football Team (now disbanded) and other college games. Community leaders had bigger plans for the stadium, however, and on August 10, 1968, began fulfilling those visions by watching the Washington Redskins beat the Atlanta Falcons 16 - 14 in the stadium's first NFL exhibition game. 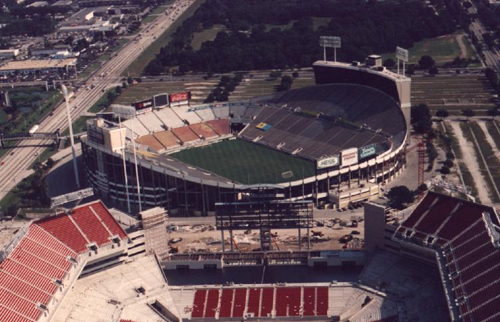 The stadium became home to the NFL's Tampa Bay Buccaneers in 1975, and underwent a $10-million renovation that included the expansion of seating from 47,000 to 72,000, the addition of sky suites, and the enclosing of the end zones. After four short seasons, in 1979 the Buccaneers fell one game short of the Super Bowl, losing to the Los Angeles Rams, 9 - 0.
Notable events held at Houlihan's Stadium include Super Bowl XVII and the USFL Championship, in 1984; the first of 10 Hall of Fame Bowls, in 1987; and Super Bowl XXV, held during Operation Desert Storm, in 1991. Fans were enthralled by Whitney Houston's heart-rending rendition of The Star Spangled Banner. General Norman Schwartzkopf and the U.S. troops were honored in May 1992 as the stadium hosted the first homecoming celebration for its hometown hero. Important annual events held at the stadium include the Florida Classic (the state's oldest and longest uninterrupted football rivalry and the nation's second-largest African-American football classic) and the American Invitational of Horse Jumping (the U.S. national championship). In addition to hosting pro and college football games, Houlihan's Stadium is a multi-use facility that sees dozens of high school games, soccer games, concerts, festivals, motor sports shows, sales seminars, equestrian events, and dog shows each year. Houlihan's Stadium has instituted several exceptional programs for its guests, including Tag-A-Kid, designed to assist parents of young children while attending events on stadium property; Safe Ride Home, a safety precaution that offers free taxi rides home to attendees who have consumed too much alcohol; and a comprehensive recycling program that encourages fans to participate by bringing their tailgating recyclables to designated stadium gate locations. "Some place are known for moments when everything went right. Famous touchdown catches. Record-setting runs. Classic playoff games. Houlihan's Stadium is known for moments when everything went wrong. The stadium's most notable tenants, the Buccaneers, entered the NFL in 1976 and lost their first 26 games. The Bucs didn't break the streak until the 13th game of their second season, and that happened at New Orleans. The tradition of losing continues to this day. The Bucs have put together and NFL record for futility - 11 consecutive seasons with at least 10 loses. But the problems aren't limited to the Bucs. It was here that a last-second Buffalo field-goal attempt went wide to the right in the New York Giants' 20 - 19 victory in Super Bowl XXV to begin the Bills' streak of four consecutive Super Bowl defeats. It was here, when Tampa Stadium often hosted pre-season NFL games, the Joe Namath suffered on of the knee injuries that cut his career short. Some locals will tell you the place is cursed. A few years ago, a radio station hired a witch doctor to remove the curse. The witch doctor stood in the parking lot, chanted some magic words and said the Bucs would begin winning. They did win that Sunday, but at the next home game things returned to normal. The Bucs not only lost, they were shut out."